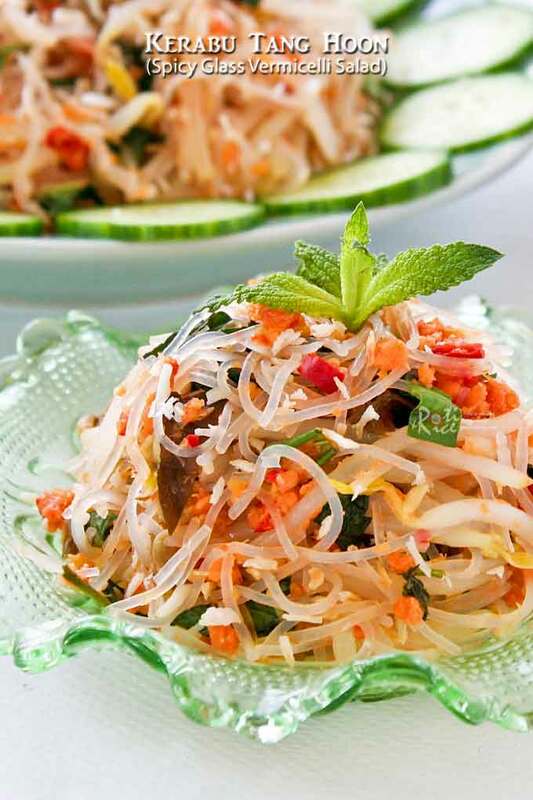 This delicious Kerabu Tang Hoon is a combination of a few well known Nyonya kerabus. It is delicious eaten as a side dish or a light meal. Today’s post is a special one. You know how we need buddies in the real world? Well, we also need buddies in the virtual world and I want to tell you about my buddy, Denise. Denise and I first “met” in January 2010 when Roti n Rice was just a month old. I used to post almost everyday then and she would swing by each day to leave me a witty comment. It was always so fun to read her comment and it often made me laugh out loud. Soon we started a conversation that grew and continues to grow. In June of that same year, I went back to Malaysia to visit my parents. On my homeward journey, I made a stop in Singapore where I met up with Denise. You can read about it here. I do not post as often now (those were the crazy days) but I still look forward to Denise’s comment. Denise is a very talented person and she has a cookbook and three food blogs under her belt. She has a very charming and engaging writing style which I enjoy. I know you will too. 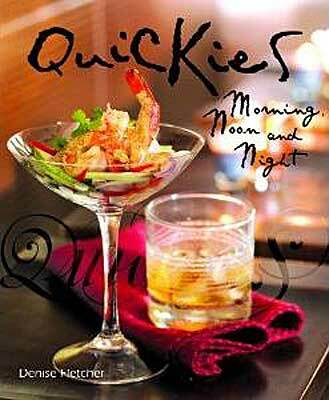 Her first blog is Quickies on the Dinner Table where she shared delicious quick and easy recipes. Because of her love for bread, she started another blog Bread Expectations where you will find the most gorgeous looking loaves. Bread making is not the norm in that part of the world but Denise makes all her own bread. This is another reason why we click as I make my own breads too. Most of them anyway. She created Marmite Boule just for me. My post was mentioned at The Kitchn’s Sticky and Savory: 7 Recipes with Marmite. Please find Denise’s post here. Her latest food blog is Singapore Shiok!. Here you will be treated to the most mouth watering Southeast Asian dishes. Singapore Shiok! reminds me of the food of my childhood which I miss. 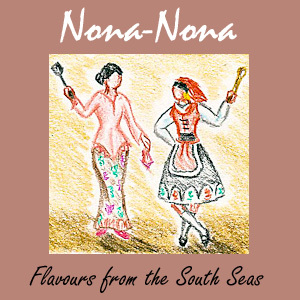 The cuisine of Singapore is very much the same as that of Malaysia. In fact, the two countries were once a single nation and so many of the dishes are similar, if not the same. Her recent post Sambal Kerang (Cockle Sambal) set me on a sambal war path. Today’s post is one and you will see a few more in the days ahead. This is the cookbook I was telling you about. In there are an eclectic mix of recipes that are quick and easy to prepare. Most of the recipes are accompanied by full pages of gorgeous pictures. I do have a signed copy in my kitchen. 🙂 Denise has been busy with various projects in the past months. She will soon be unveiling them….. So, in celebration of our friendship, we have decided to come together once a month to feature a chosen dish or a particular cooking style. It is always so fun to cook with friends and even though we are separated by miles, thanks to the internet we can still cook together virtually. For our inaugural twin posting, we have chosen to feature Kerabu, a Nyonya (Peranakan) or Malay salad. Please head over to Singapore Shiok! to see what Denise has prepared. I grew up eating kerabu and ulam, which is another class of salad consisting of raw vegetables that are quite different from those found here in the West. Kerabu is a mix of vegetables and fragrant herbs with a spicy tangy dressing. Often times coconut milk and Kerisik (toasted grated coconut) are added to the dressing. Vegetables may include cucumbers, sprouts, cabbage, and various pucuk which are young leaves or shoots of plants like that of ginger and mangoes may be eaten raw. Yes, mango shoots (pucuk mangga) that are still light brown in color may be eaten. Other vegetables that need to be blanched include long beans, sayur paku (young fern shoots aka midin), and jantung pisang (banana hearts aka banana shoots). 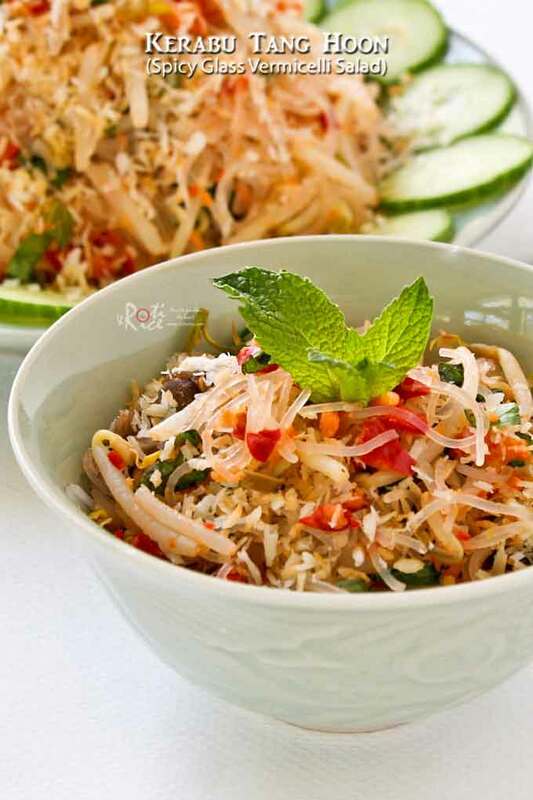 This recipe is a combination of Kerabu Tang Hoon (Spicy Glass Vermicelli Salad), kerabu bok nee (cloud ear fungus salad), kerabu taugeh (bean sprout salad), and Kerabu Timun (Spicy Cucumber Salad). Why make four kerabus when you can combined them all into one. 🙂 For a brighter and lighter taste, I used Mom’s kerabu timun dressing minus the belacan (shrimp paste). It would be nice to add some bunga kantan (torch ginger) but I have never seen it here and so I substituted it with daun kesum/chen hom/polygonum/Vietnamese mint. Rinse and soak glass vermicelli, cloud ears fungus, and dried shrimp in separate bowls for about 15 minutes. Drain. In a small fry pan, toast unsweetened dried grated coconut or freshly grated coconut until fragrant and light brown in color. Remove and set aside. Bring a small saucepan of water to boil. Add cloud ears for about 30 seconds. Remove and plunge into cold water bath. Lower dried shrimps with a metal strainer into boiling water and allow it to cook for 2 minutes. Remove and drain. Drain cloud ears and peel away all the hard parts. Cut into thin strips. For the dressing, juice the limes to get about 7 to 8 tablespoons of lime juice. Place cooked dried shrimps and chilies in a mini chopper. Add 1 tsp sugar and a pinch of salt. Pour in lime juice. Blend until fine. Remove and set aside. Bring a medium sized pot of water to boil. Add glass vermicelli and allow it to cook for about 2 minutes. Remove and plunge into cold water bath. Drain and place into a large bowl. In the same pot, add bean sprouts for 30 seconds. Remove and plunge into cold water bath. Drain and place into bowl with glass vermicelli. 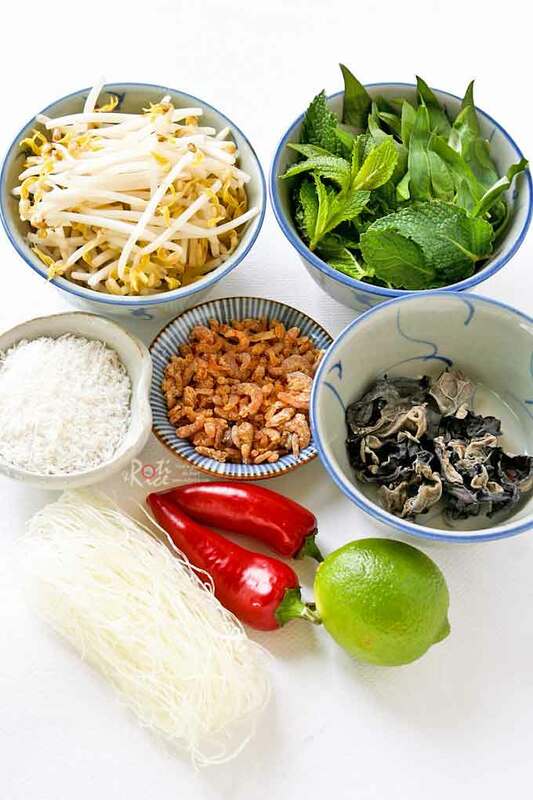 Add cloud ear fungus, mint leaves, daun kesum, and dressing to the same large bowl. Give the ingredients a good toss until everything is well mixed. Transfer kerabu to a serving dish. Sprinkle with toasted coconut and serve immediately. Kerabu may also be covered and chilled in the fridge. When ready to serve, remove and sprinkle with toasted coconut. Haha! I’m glad we didn’t post the same kerabu!!! Yours looks lovely, as is everything you do! Thanks for all the lovely mentions. Yes we definitely need buddies in this and real life and I’m glad you are mine 🙂 Our rocky start in the blogosphere seems a lifetime ago – so many posts later LOL Will never forget though, the thrill, joy and sometimes heartbreak of starting out on something that is important to you and that you want so much to succeed. I’m looking forward to continuing this journey with you, and also to seeing what else my kerang sambal has inspired in your kitchen! 😉 Happy Kitchen Collaboration Day my dear Biren! This is great! Two of my favorite bloggers are teaming up to do twin posting. When I was a new blogger, Denise was one of the first few people who visited very often and left me very supportive and encouraging comments. I still remember how excited I was when I found out Denise, an amazing blogger and a cookbook author, added the link to my blog to her blogroll. Look forward to many more of these twin posts! Thanks Hyosun for your kind words. I appreciate your support here and on Facebook. Yes, Denise is a wonderful blogging buddy to have. 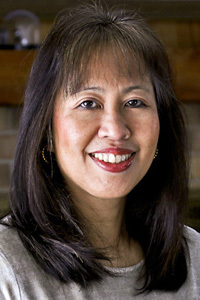 She is a very talented chef and her three blogs attest to her ability as a recipe developer and writer. Stay tuned…she has more in the works! This is soooo appetising. I can do with more helpings as I simply enjoy kerabu of all sorts! Thanks Cheah! I love kerabu too and don’t make it often enough. With warmer weather, I should put it on my menu rotation. Oh yeah, I’m so glad Denise is back again. She has been so busy writing & travelling. Awesome lady ya! Kerabu is one of my fav especially kerabu mango with toasted dried shrimps & cuttlefish. And yours is something unusual. Kudos! Looking forward to more wonderful recipes from both of you. I have to try your kerabu mango. Reminds me of one that I ate at a Thai restaurant years ago. Wow, Biren. I don’t think I’ve even heard of a third of the ingredients you mentioned in that dish, but it’s gorgeous. 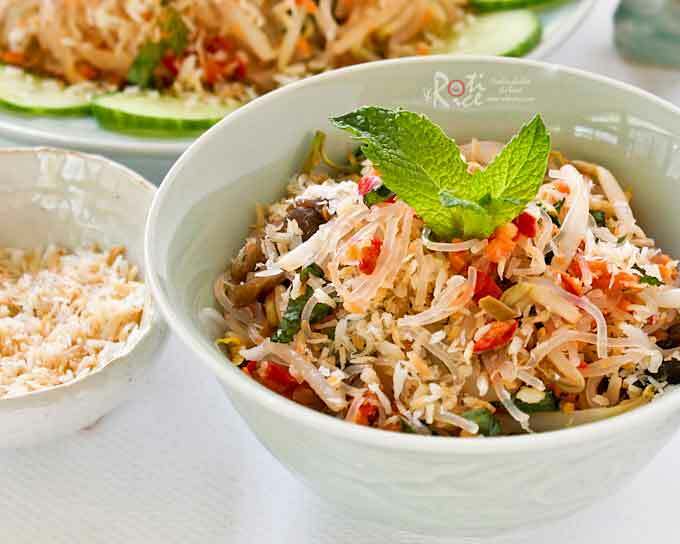 There’s something about glass vermicelli noodles that is breathtaking and you know how to use them well. Congratulations on your new venture with Denise. It will be fun to head over and see what she’s done too. All the ingredients can be found at the Asian grocery stores here. I hope you will give it a try. I love glass noodles too and use it quite often in my cooking. They do have a pretty translucent quality about them. When mixed with the right sauces, they are very tasty too. You are a sweetheart, Ruby! Yes, I like mine with lots of glass noodles either wise it won’t be a glass noddle salad. This salad whets one’s appetite as it is light and tangy. I hope you will give it a try. Lovely piece about how both of you establish a friendship in the virtual arena of food blogging. Such a wonderful post Biren! The salad looks lovely, would love to eat this everyday in summer! Thanks Ambika for your kind comments and for visiting. This salad is very refreshing eaten on its own. Do give it a try. Hola Biren, how fun!! two of my fav gals together..so glad denise is blogging again, she was missed! I love kerabu as they are so tasty and refreshing. Never get tired of them. So glad to hear you like them too. Happy weekend to you as well. Its nice to have friends met on the cyberspace specially when you share the same passion, like me someday if time and permits I want to meet also everyone that I met on my blog. mmm…this is very refreshing and appetizing. What a wonderful friendship! And this dish sounds delicious! I never know what to do with glass vermicelli. This looks like a great option! I’ll go check out Denise’s blog! What a fantastic post Biren, it is very special! I think it is so cool that you got to meet in person. I love that about blogging…having on line virtual friends as well as in person buddies! Hey, just came over from Denise post. Was telling her how ashamed I am for not knowing what’s Kerabu. Lol! 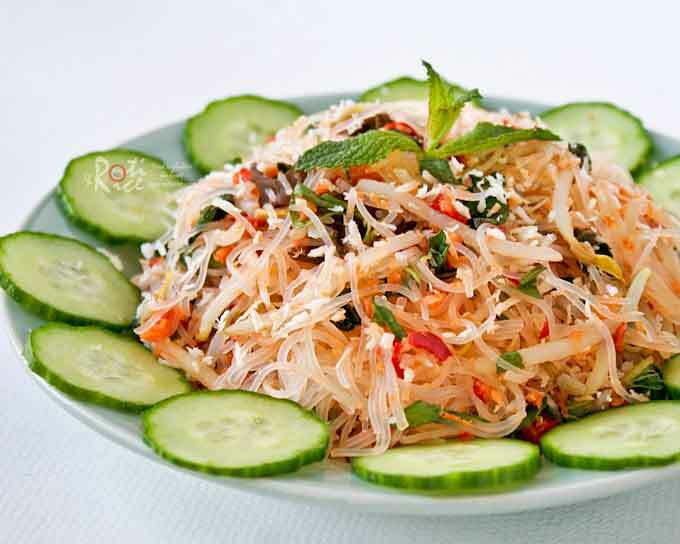 I love glass noodles and this dish looks delightful. Very nice! This looks absolutely delicious! Cant wait to try it! I have made a vermicelli dessert, maybe you can try that!